Begin a small revolution in your customer’s kitchen: innovative hansgrohe sinks combined with our kitchen taps form a formidable duo. The minimalist sink design featuring the rectangular basic shape in classic, timeless stainless steel will integrate seamlessly into modern, functional kitchens. The wide L-shaped rim provides the perfect platform for the high-quality kitchen mixer and offers it stability. This is ensured by the 1 mm hand-welded stainless steel and reinforced tap ledge. 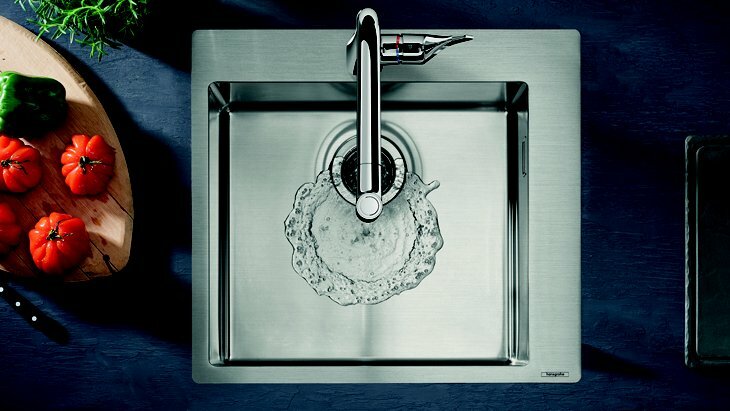 Use hansgrohe products to transform the sink unit into an eye-catching feature in the kitchen! Whether it’s a new construction or a renovation project: show your customer how to use a hansgrohe sink to enhance the most frequently-used kitchen workspace. Different installation variants are available, with the option of a single or double bowl sink. Robust materials and quality workmanship provide you with some strong selling points. The new sinks are extremely versatile: ideal as an undermount sink, integrated flush with the worktop, or as a built-in sink. The range offers customised workflow solutions, so your customer can choose one or two bowls, or the variant with a draining board. You can also show your customer how the innovative control unit on the front rim of the sink works. In combination with different tap variants, these sinks are easy to use by means of a rocker lever or Select push button. Amateur chefs are not the only customers who will be impressed by this.